RETAIL EU TRADERS CAN NOW TRADE FX OPTIONS, WHICH IS A GREAT ALTERNATIVE TO BINARY OPTIONS. IQ Option’s FX options cover 13 forex currency pairs, Crude Oil Brent, Crude Oil WTI, gold, silver, and 7 stock indices. FX Options can be traded with the following expiry times: 10 minutes, 20 minutes, 30 minutes, 40 minutes, 50 minutes, and 60 minutes. However, because trades can be entered late, a trade’s actual expiry time may be less than the times mentioned above. 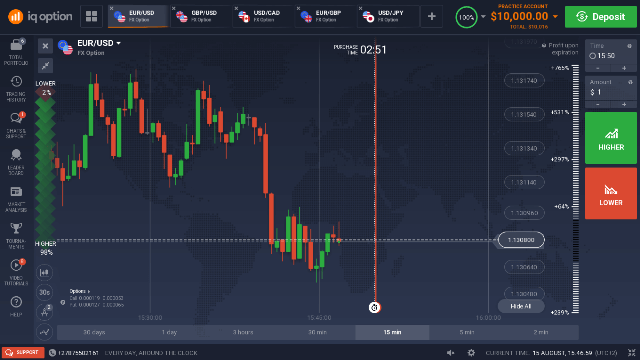 For example, a 10-minute FX option contract can be entered more than 9 minutes late, which means that you can actually enter a trade which expires in less than 1 minute. Likewise, if you entered 5 minutes late on a 40-minute FX option contract, your actual expiry time would be 35 minutes from the moment you entered the trade. Positions taken on FX option contracts can be closed prematurely (before the expiration time) and have virtually unlimited profit potential (for successful deals). Also, in the case of out-of-the-money trades, the amount which is lost can in some cases be less than 100% of the investment amount. FX Options Versus Binary Options - What are the Differences? 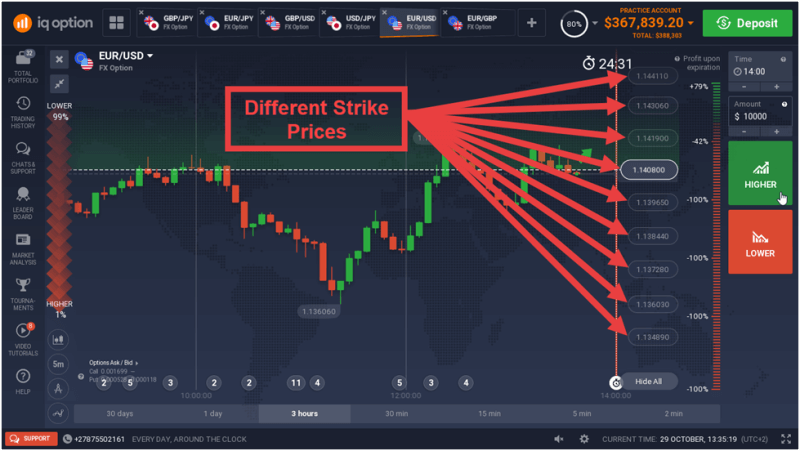 With binary options, traders can only trade at the current strike price of the options contract but with FX options, they can choose between a number of different strike prices which are available at that particular time. AN EXAMPLE OF AN FX OPTION ON THE EUR/USD WITH DIFFERENT STRIKE PRICES TO CHOOSE FROM. Each binary option contract offers a reward that is less than the possible loss. For example, with an investment of $100 in a binary options contract with a profitability percentage of 90%, a trader will gain $90 (at expiration) in the case of a winning trade and lose $100 (at expiration) in the case of a losing trade. Certain binary option contracts can be closed prematurely. In this case, the loss may be less than 100% of the investment amount in the case of a losing trade and the profit (in the case of a winning trade which is closed prematurely) will also be less than the maximum profit which might have been gained at the time of expiration. On the other hand, FX options have the advantage of much more flexibility when it comes to risk to reward ratios. On each individual FX options contract, traders cannot lose more than the amount they invest. However, because they can choose the strike price, they have the ability to alter the risk to reward ratio. So instead of being limited to a maximum payout of, for example, 90%, they can achieve gains which are basically unlimited. There is a notable difference between the expiration times available with binary options and FX options. IQ Option’s binary options (excluding OTC binary options) can be traded with expiry times that vary between 30 seconds and 30 days. There are a couple of expiries between 30 seconds and 10 minutes as well as two longer contracts, namely ‘end of the day’ and ‘end of the month’. As explained already, FX Options have expiry times of one hour and lower. So, the big difference is, that with FX options, you don’t have access to the ‘end of the day’ and ‘end of the month’ expiries like you have with binary options. While FX options can only be traded 5 days a week, certain binary options can be traded over weekends when FX options (and standard binary options) are not available. These instruments are called OTC (over the counter) binary options. When comparing FX options with binary options, we find that IQ Option offers many more binary options than FX options. With binary options, clients can trade roughly 34 currency pairs, 22 stocks, two stock indices, and gold. On the other hand, FX options are currently available in 13 currency pairs, 4 commodities, and 7 stock indices. The number of instruments available in binary options and FX options can change at any time, and IQ Option will probably add more instruments currency pairs to the group of FX options soon. As mentioned earlier, retail traders from the European Union are not able to trade binary options and digital options with IQ Option due to ESMA (European Securities and Markets Authority) regulations. On the other hand, retail EU traders are able to trade IQ Option’s FX options which comply with ESMA’s regulations. With FX options, IQ Option has made a way for retail EU traders to trade a type of options contract that replaces the binary options that were previously available to them! CAUGHT IN ACTION: AN OPEN FX OPTION TRADE ON THE EUR/USD EXECUTED ON IQ OPTION’S MOBILE APP. 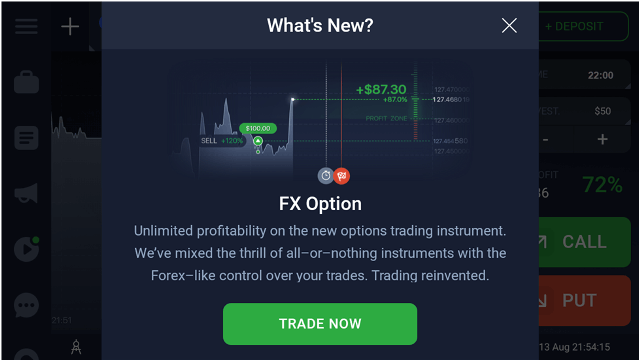 Retail EU traders who fancy FX options can trade it via IQ Option’s web, desktop, Android, and iOS platforms. IQ Option’s demo or practice account is really worth mentioning. It has all the features of a real money account and does not expire like many other demo accounts. With this demo account, traders can practice with $10,000 virtual money and acquaint themselves with the markets and trading instruments before trading with real money. This account can be topped up to the original value of $10,000 at any time, which is a pretty convenient feature. Traders can also switch between their real and demo accounts without even leaving the trading platform. Don’t forget that IQ Option’s demo account is yours to use free of charge! 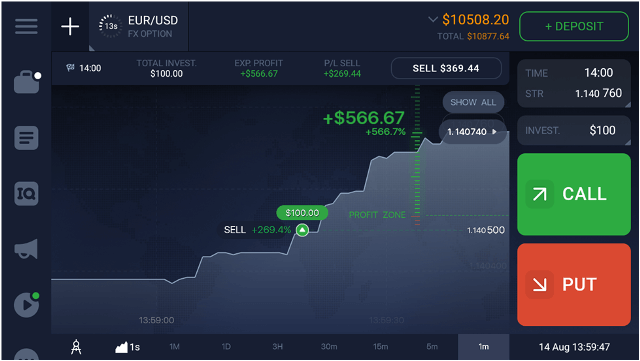 With a deposit of only $10, clients can access a real money account with IQ Option and start trading certain instruments like forex pairs, stocks, and commodities with an investment amount of only $1. FX options require a minimum investment amount of 25 euro or $30, however. Technical indicators - Moving averages, oscillators, ATR, Ichimoku Cloud, Fractal, and many more. Different chart types - Line charts, candlestick charts, bar charts, and Heikin-Ashi. Graphical tools - Different lines including Fibonacci. Widgets - See the following widgets right on your charts: ‘Traders’ Mood’, ‘High and Low Values’, ‘Other Traders’ Deals’, ‘Volume’, and ‘News’. IQ Option clients can easily contact its support team via the ‘Chats and Support’ tab on the left side of the trading platform. At the bottom left of the platform you will also see a telephone number that you can call 24/7. The chat feature is also available at any time of the day and week. Customer support is available in 13 languages.